Just because they don’t make film for a particular analogue camera anymore, doesn’t mean you should pass up the opportunity to own one. This is exactly what I thought when I recently had the opportunity to take home a Polaroid 360 Land Camera (for free!). At the very least I thought it would make a really cool objet d’art – a great addition to my growing collection of vintage cameras. I was curious to learn more about my new acquisition so I did what anyone would do in this day and age, I “Googled” it. I was pleasantly surprised to find out that with only a few minor battery adjustments I could actually shoot film with this camera. What fun! Fuji makes pack film that fits into the Land Cameras. Fuji Color Film FP-100C and Fuji B&W Film FP-3000B are the only peel-apart-type instant films currently being produced*. 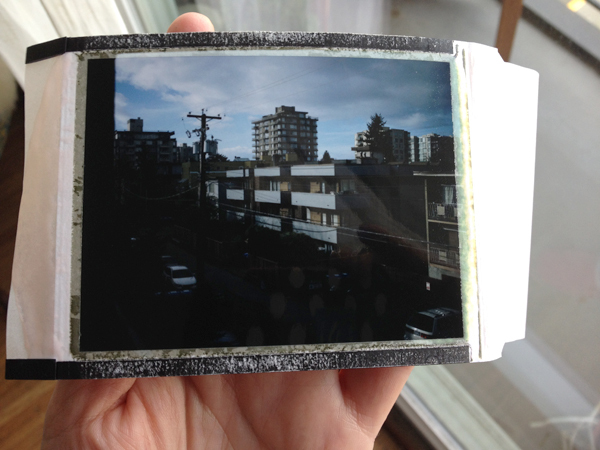 One of the first sites I consulted was Instructables.com – “Resurrect a Polaroid Land Camera“. 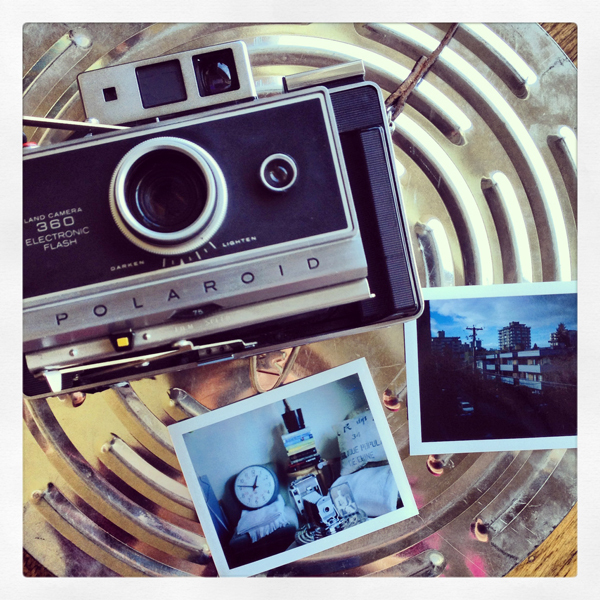 The author of this post created a complete illustrated guide for getting started with the Polaroid Land Camera. In 33 steps, the author covers acquiring the camera and film, upgrading the battery, basic functionality, timing exposures, photo tips, and using a flash – it is a great resource. 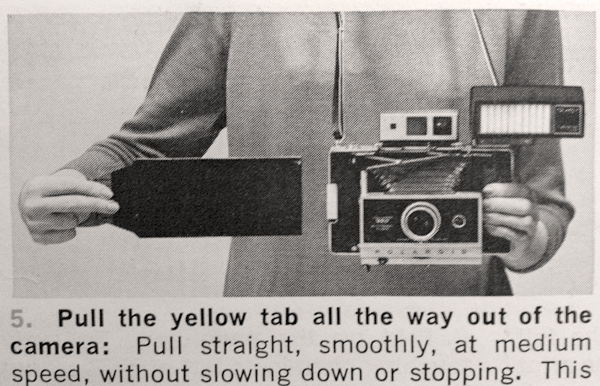 I was most interested in the section about “upgrading the battery” as this was the one aspect of using these cameras that apparently needed to be addressed. However, in order to upgrade the battery, I would need to solder in a 2-AAA battery holder. Since I didn’t own a soldering setup, I decided to check out some more options for battery upgrade modifications. The next blog I consulted, lo-fi photography, offered several versions of battery modification using electricians tape. Much better I thought, I could actually see myself doing some of these. But, then I found the simplest battery conversion yet, using 2 CR123 batteries and a rubber band, on the photo.net forum. We have a winner! I purchased two Duracell 123 photo batteries for $20 and looked around my home for a good rubber band. 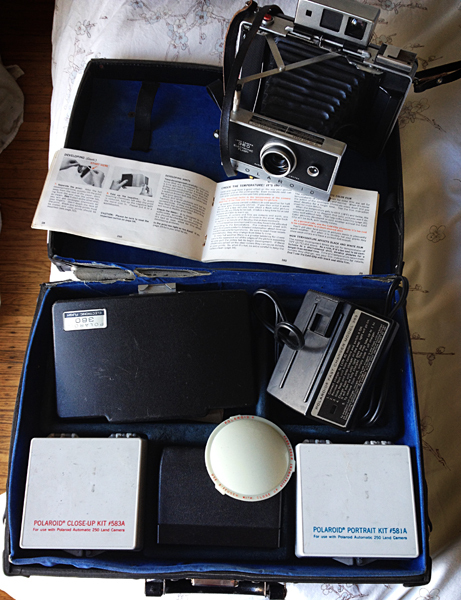 My Polaroid Land Camera and all of its accessories! Photo: C.Hagemoen. In the meantime, I still needed to purchase some Fuji film to see if this would all work out. I am fortunate to live very close to Beau Photo Supplies, “one of the largest [and friendliest] professional supply stores in Western Canada specializing in cameras, accessories, equipment rental, film, and more”. They carry all sorts of interesting products including the Fuji instant film packs that I was looking for. To make a long story short, while I was at Beau Photo I learned that they carry the original #532 3V batteries required for the Land Camera and they are only $7 each! So much for the theory that these batteries are expensive and hard to get a hold of. Needless to say, I bought the battery (and the film) and that was that. In previous posts I have written about the history of the Polaroid Land Camera and my experiences with Polaroid’s SX-70 Land Camera. So I won’t go into much detail about this model of Land Camera, except to say these cameras were developed after the roll film models and were designed to use the newly developed 100 series pack film. 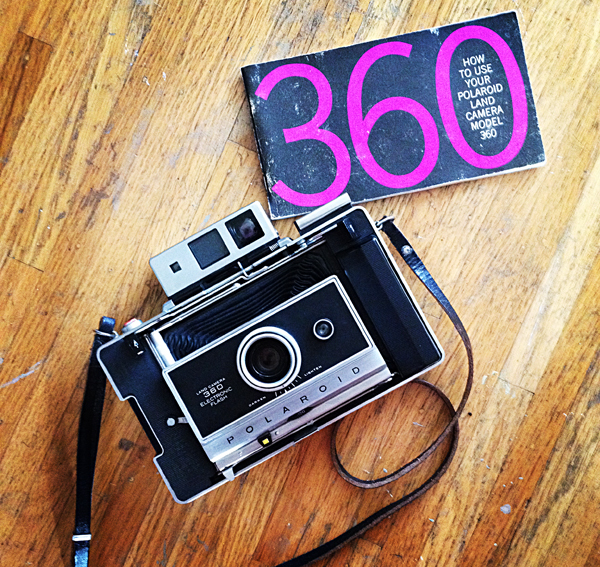 Part of the 300 series of cameras, the Land Camera model 360 was a folding pack film camera produced from 1969 -1971. An upgrade from the 350 model, the 360 originally retailed for about $200 and came with special electronic flash unit which couples to the focusing mechanism of the camera to provide auto flash exposure. 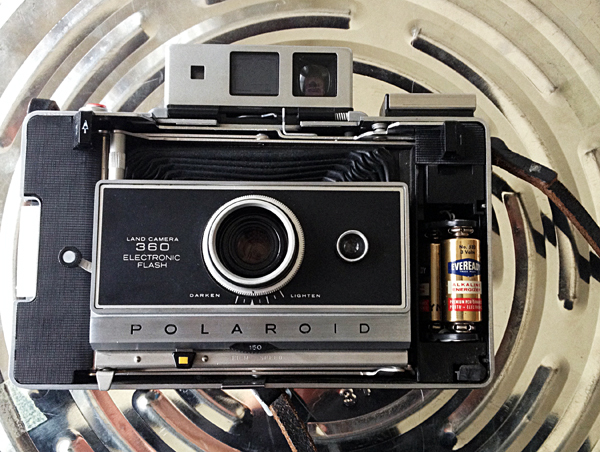 How To Load Film into a Polaroid Land Packfilm Camera – YouTube. I was very excited to start using my camera, so after consulting my manual and some of the online resources I loaded up some film. I had a little trouble getting the black protective sleeve out – it ripped. So I opened up the back and grabbed a little bit more and this time it worked. The ambient temperature is very important in regard to film development. Cold and heat have a great effect on print development and quality. Since it was a cool day, and I was using colour film, I decided to use the Cold-Clip. The Cold-Clip makes it possible to get good colour pictures when the temperature is below 18 degrees Celsius. You need to warm the Cold-Clip in your pocket for at least 5 minutes before you begin. I found the most difficult part of using my camera was trying to pull the film from the camera after exposure [ it wasn’t as easy as the photo above would lead you to believe]. I ended up losing a few frames during my inaugural experiment. I persevered and finally success… my first photo! Not terribly exciting and a little dark, but I was rather impressed with the results. I decided to adjust the lighten/darken control for my next exposure. I ran into a little trouble between the two photos and had a frame get stuck in the camera. When I finally pulled it out, I must have pulled too hard because the next unexposed frame came out as well and oozed caustic gel all over the place. After washing my hands, I tried the exposure again and was successful in producing my 2nd picture. The exposure is better on this image. You may notice the excessive amount of caustic gel on the negative and Cold Clip, but the leak didn’t appear to affect the exposure. I will just have to be sure I thoroughly clean the rollers before I load another pack of film into the camera. I am really looking forward to getting out on the next ‘warmish’ sunny day and experimenting more with this camera. Though this blog is essentially about “celebrating the analogue in this digital world”, one thing I truly appreciate about our digital world is instant access to all the online resources about analogue instant photography. * Summer 2016 update: So, as with all things Polaroid, the Fuji film used in the post is no longer in production. The last of the film is being sold in speciality camera and film stores, like Beau Photo, right now. Get it, before it disappears forever. I’m keeping my stash in my fridge. Have acqired a polaroid 360 land camera and it still has film in it. The leather strap is intact. What is the value of a vintage camera like this? Hard to say. It really depends on the market and the condition. I would check on EBay to see what other cameras like it are going for, or maybe there is a camera/film shop in your area that sells things on consignment etc…. Sometimes people will buy cameras purely for their esthetic value and sometimes they want to use them, or both! 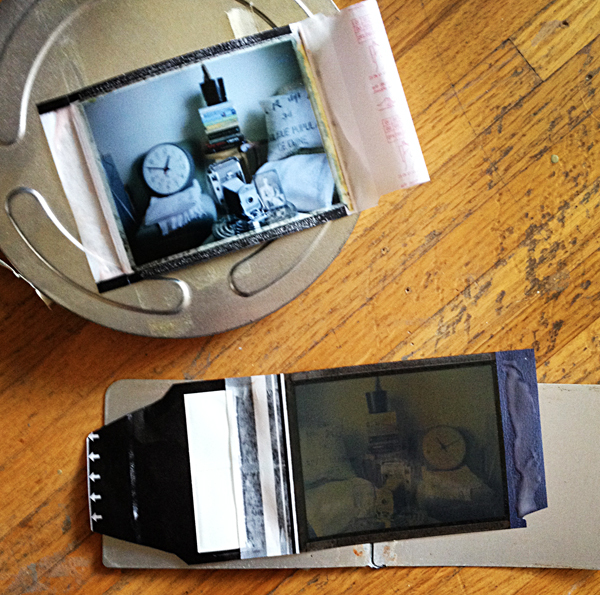 The Fuji flat pac film has a flimsy backing. It can cause jamming on some models. Wasting prints. I cringed when I saw you throw away the old film pack. Those have a metal back and you can pull them apart and replace the flimsy Fuji backing with the sturdy ones from a old used pack..they just slide and push one and you can do it in full light. I have a big shot..and this is especially a problem with camera with the on film door. It jammed for the first two new film packs until I replaced the backing with ancient metal one that was in the camera when I got it…Cleaning the rollers as you did probably helped too. I should clarify. “The jamming problem is especially a problem with models that have *A TIMER* on the film door”, The little extra ‘hump’ puts pressure on the thin plastic of the fuji pack film. Replacing that back cover on the fuji film pack with with old style metal back works great to stop jamming problem, The back covers of the film pack just pop off…squeeze the sides a bit pull. And to put them on just slide and push down. It was much easier than I thought. I practiced on a used Fuji pack and the old school metal pack to get the feel of it. And speaking of timer. I’m not familiar with the 360 model. Where is the timer on it that requires the battery? What are the specifics of how the timer works? However the jamming problem is rather random of different camera and tolerances. The fix worked for me. . Thanks for the website. Good info here. /sorry for the double post..but I wanted to clarify and give a bit more info. Thanks for all the tips/ links about the fuji film. I will be trying again soon, and will try some of your tricks to see if that works better. The timer on the camera (as I recall, its packed away right now) is on the top of the camera, I’m not really sure it works.I just timed my exposures manually. 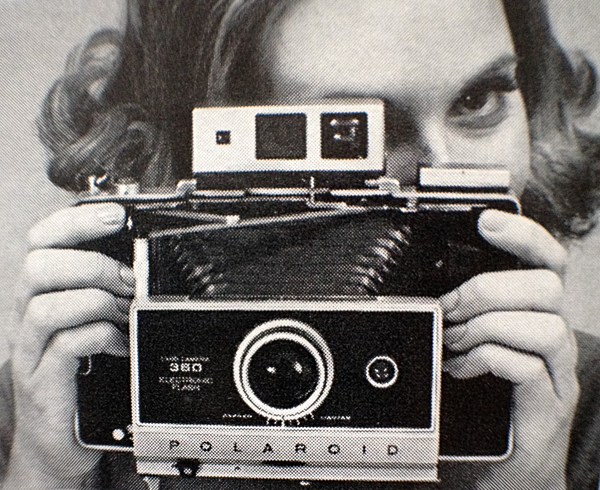 I bought the Polaroid 360 camera brand new when it first came out. I bought the Fuji film pack and had problems with it. Why Fuji decided to put 10 pictures in a film pack designed to hold only 8 is beyond me. To solve the problem I was told to close only the top part of the camera door. I had no problem pulling out the protective black cover and the first two pictures. After that I could close the bottom part of the camera door and continue to shoot with no problem. I also had to set the darken and lighten control, on the camera all the way to lighten for outdoor pictures. The results were fantastic! Indoor, using the electronic flash just set the control to one notch to lighten. Thanks for the tips. I will try this next time I buy film. I kind of gave up on the camera…but now I am inspired to give it another chance. Good post. I was confused about the need to modify the battery compartment since I found some batteries online. But getting them shipped to Alberta wasn’t cheap. Unfortunately I couldn’t find anything local. So I’m not sure what I’ll end up doing. Thanks Charlie. I was also confused at first about the battery thing… my MacGyver skills are limited… that’s why I was excited to see the exact same battery I needed (no modification necessary) at my local camera shop – Beau Photo – in Vancouver. Perhaps you could contact them and see if they will ship/mail you the correct battery.